Tell Qeni (1803 m) is the highest point of Jabal al-Druze. Jabal al-Druze (Arabic: جبل الدروز‎, jabal ad-durūz, Mountain of the Druze), officially Jabal al-Arab (Arabic: جبل العرب‎, jabal al-ʿarab, Mountain of the Arabs), is an elevated volcanic region in the As-Suwayda Governorate of southern Syria. Most of the inhabitants of this region are Druze, and there are also small Muslim and Christian communities. Safaitic inscriptions were first found in this area. The State of Jabal Druze was an autonomous area in the French Mandate for Syria and the Lebanon from 1921 to 1936. In the past, the name Jabal al-Druze was used for a different area, located in Mount Lebanon. The Jabal al-Druze volcanic field, the southernmost in Syria, lies in the Haurun-Druze Plateau in SW Syria near the border with Jordan. The most prominent feature of this volcanic field is 1800m-high Jabal al-Druze (also known variously as Jabal ad Duruz, Djebel Al-Arab, Jabal Druze, Djebel ed Drouz). The alkaline volcanic field consists of a group of 118 basaltic volcanoes active from the lower-Pleistocene to the Holocene (2.6 million years ago to present). The large SW Plateau depression is filled by basaltic lava flows from volcanoes aligned in a NW-SE direction. This volcanic field lies within the northern part of the massive alkaline Harrat al-Shamah (also known as Harrat al-Shaam) volcanic field that extends from southern Syria to Saudi Arabia. In Arabic, the word "tell" means "mound" or "hill", but in Jabal al-Druze it rather refers to a volcanic cone. "Jabal ad Druze". Global Volcanism Program. Smithsonian Institution. The Hauran also spelled Hawran or Houran) is a region that spans parts of southern Syria and northern Jordan. It is bound in the north by the Ghouta oasis, in the east by the al-Safa field, to the south by Jordan's desert steppe and to the west by the Golan Heights. Traditionally, the Hauran consists of three subregions: the Nuqrah and Jaydur plains, the Jabal al-Druze massif, and the Lajat volcanic field. The population of the Hauran is largely Arab, but religiously heterogeneous; most inhabitants of the plains are Sunni Muslims belonging to large agrarian clans, while Druze form the majority in the eponymous Jabal al-Druze and a significant Greek Orthodox and Greek Catholic minority inhabit the Jabal's western foothills. The region's largest towns are Daraa, al-Ramtha and al-Suwayda. 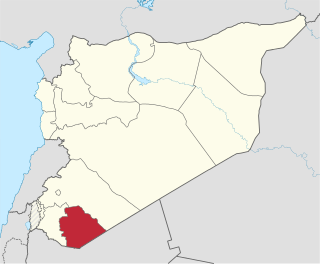 Al-Suwayda Governorate is one of the fourteen governorates (provinces) of Syria. It is the southernmost governorate and has an area of 5,550 km² and forms part of the historic Hawran region. Its capital and major city is al-Suwayda. A large majority of the population are Druze. The Lajat, also spelled Lejat, Lajah, el-Leja or Laja, is the largest lava field in southern Syria, spanning some 900 square kilometers. Located about 50 kilometers (31 mi) southeast of Damascus, the Lajat borders the Hauran plain to the west and the foothills of Jabal al-Druze to the south. The average elevation is between 600 and 700 meters above sea level, with the highest volcanic cone being 1,159 meters above sea level. Receiving little annual rainfall, the Lajat is largely barren, though there are scattered patches of arable land in some of its depressions. Kurd Mountains or Kurd-Dagh, also called Aleppo Mountain, is a highland region in northwestern Syria and southeastern Turkey. It is located in the Aleppo Governorate of Syria and Kilis Province of Turkey. The Kurd mountain should not be confused with the neighboring Jabal al Akrad which is located further southwest towards the mediterranean coastline. Salkhad is a Syrian city in the As Suwayda governorate, southern Syria. It is the capital of Salkhad District, one of the governorate's three districts. It has a population of 15,000 inhabitants. 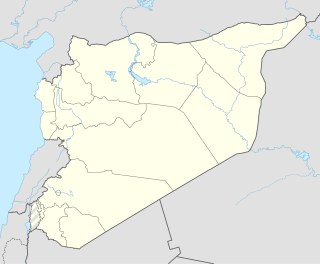 Shaqqa or Shakka is a Syrian town in As Suwayda Governorate in southern Syria, whose some 8,000 inhabitants are mainly Druze, descendants of those who migrated here from Lebanon in the 18th and 19th centuries. Al Harrah is a large basaltic volcanic field in northwestern Saudi Arabia near the Jordanian border. It covers an area of 15,200 km2. The volcanic field forms the southern third of the massive Harrat al-Shamah volcanic field, which extends from Syria through Jordan into northern Saudi Arabia. It is in the Tabuk Region of northwest Saudi Arabia. It is one of a series of Quaternary volcanic fields paralleling the Red Sea coast. The Ḥarrat ash-Shāmah, or "Black Desert", is a volcanic field covering a total area of some 40,000 km2 (15,000 sq mi). This massive alkaline volcanic field extends from southern Syria, across Jordan, and into northwestern Saudi Arabia. This wide extended basaltic province contains more than 800 volcanic cones and around 140 dikes and ring dikes. The Jabal al-Druze, al-Safa and Dirat al-Tulul volcanic fields, among others, form the northern and Syrian part of the Harrat al-Shamah; Al-Harrah is in the southern, Saudi Arabian, third of the field. As-Safa, also known as Tulul al-Safa, Arabic for Al-Safa hills, is a hilly region which lies in southern Syria, north-east of Jabal Al-Arab volcanic plateau. It consists of a basaltic lava field of volcanic origin, covering an area of 220 square kilometres, and contains at least 38 cinder cones. This volcanic field lies within the northern part of the massive alkaline Harrat Ash Shamah volcanic field that extends from southern Syria, through eastern Jordan to Saudi Arabia. The region is extremely scarce in water. A boiling lava lake was observed in the Es Safa volcanic area in the middle of the 19th century. The Hauran Druze Rebellion was a violent Druze uprising against Ottoman authority in the Syrian province, which erupted in 1909. The rebellion was led by the al-Atrash family, in an aim to gain independence, but ended in brutal suppression of the Druze, significant depopulation of the Hauran region and execution of the Druze leaders.